Off season testing is never a reliable indicator of form but this year's has been even less informative than usual. With rain making a nonsense of the Spanish tests and the Bahrain test introducing sandstorms into the mix, it is impossible to get a feel for the potential performance of the 2009 cars. Bahrain seemed to indicate that the three teams that attended, Ferrari, Toyota and BMW, are very evenly matched but only Ferrari and Toyota have looked competitive with the other teams on the wet Jerez track. Red Bull led the times while they were using the 2008 car but became unpredictable with the introduction of the RB5; the Renault has looked reasonable in the hands of Alonso and awful once Piquet jumped in the car. Williams has been more consistent than most and has set some respectable times. But McLaren has not set the world alight and the car has been slow at Jerez so far; the new Force India has been surprisingly quick and promises to improve at least to midfield this year. It is all very confusing and allows us very little insight into form for the coming season. Usually we would have a vague idea of which teams would be likely to do well but this time the only thing we can be reasonably sure of is that no one has made a quantum leap forward. If anything, the cars seem pretty evenly matched and the changing order on each day's time sheet is probably more dependent on what type of test each team was running, rather than any significant difference in performance. Overall, the team that seems in best shape is Toyota - regardless of venue and weather, their car has set quick times. That fits with my feeling that this could be a breakthrough year for the team - the car is going as well as it looks and the drivers are happy. Toyota's first win may not be too far away. Perhaps the most welcome surprise has been the good performance of the Force India straight out of the box. The team had a troublesome first year and are due some good fortune - the VJM02 may be the car to do it. Certainly, both Fisichella and Sutil are enthusiastic about it and talking of finishes in the points; looking at the times (as few as they are), they could well be right. Some of the improvement can be put down to the McLaren engine and drivetrain, no doubt. But the chassis must be working well too for so immediate a surge forward to be apparent. For the team's sake, I hope it lasts into the season and we can have a battle royal for those midfield places. It remains anyone's guess as to which team will be the one to beat. The obvious choice, Ferrari, is not showing its usual pre-season superiority and McLaren are being accused of sandbagging, so lackluster is their showing to date. BMW have been disappointing but that does tend to be normal for them - strangely, they seem to think that it's the race that matters most. New contenders include Toyota, as I have said, and Red Bull are looking good with young Vettel on board. Williams has impressed but memories of the same at this time last year dampen hopes to some extent on that score. And I do not believe that Renault have built a race winner either, whatever they may say. Alonso will make a difference as he always does, but I foresee another hard year for him in 2009. There are still two teams to present their challenger for the season: Toro Rosso and Honda (Brawn Racing, if rumor is correct). The STR4 is a Ferrari-engined RB5, of course, and can be expected to be competent as a result, but the Honda could be anything from good to awful. Somehow I do not see either team rising above midfield, however. This is vague guesswork and much could change before Melbourne at the end of the month. The only definite feeling I have is that Toyota will be a serious threat this year and I would not be surprised if they exceed their stated target of one race win. Which would be a breath of fresh air, at least. I have read reports that McLaren and Renault might be sandboating, which makes sense as Mclaren seems to be going out of its way to make impossible to evaluate the teams performance and the differance between Alonso and Piquet performance at Renault is just to huge to justify on the drivers only. Red Bull looks very fast with Vettel and not as much with Webber, which I guess might just mean Webber isn't 100% yet. I agree that Toyota looks good and I hope they win a race this season. I'm afraid we gonna get Williams recent history all over again, good tests and good early races but out of pace by the time European races start. Ferrari's pace would be good if it was any other team but Mclaren, for Ferrari it isn't impressive enough. And BMW is a big question mark. I think Force India times are good, but their number of laps is small enough to suggest that they still didn't get the reliability right (and that was a worse problem last season than lack of pace). If everyone is a midfield contender, who will be bringing up the rear? Filipe: I agree regarding Alonso and Piquet - the difference between them isn't as great as the times seem to indicate. But the Renault still looks very variable, quick one minute and then inexplicably slow the next. I think they have a lot of sorting out to do before the season starts. McLaren have been good for so long that, if they're slow, we immediately blame sandbagging. I'm not so sure. They are as capable of getting something wrong at the design stage as anyone else, the difference being that they will find and fix the problem quicker than most. So I expect them to be at or near the front, whatever is going on in testing. Otherwise, I think we're pretty much in agreement. Don: Ah, you spotted that, hey. I thought of predicting the tailenders and then realized that I hadn't the faintest idea! If I were forced to guess, I would probably go for Honda/Brawn and ummm, maybe Toro Rosso. 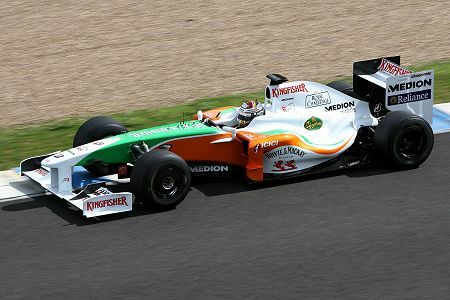 I really don't want to say Force India since I'm hoping they have a good year and the signs have been good so far. But I wouldn't bet against this being a false dawn. Not sure their drivers are good enough to keep up the challenge too. Ouch, Uppili, that hurt! Okay, my predictions aren't always right but that is the nature of mixing present performance with hope - sometimes the result is a mess. Easy...that was a bit of light hearted fun!! On a serious note, i don't think when we go to OZ land, i don't expected teams to be so bunched up as it is in testing. BMW is sand bagging for sure and come Melbourne they will we flying. The question is, whether they will be on a par with Ferrari and Mclaren or will they be better? Red bull will be fast but not reliable throughout the season. They will be a thorn on the third best teams' rear. May be a podium here and there and may be even an opportunistic victory like Kubica had last year, but not a regular contender for wins. FACT: Adrian Newey can either build a reliable car or a fast car, not both!! Oh, I knew you were just teasing, Uppili. In fact, it made me smile, to be reminded of how badly I got that one wrong! I can't escape the feeling that the closeness of times has something to do with how close it's getting to a spec series. Too many constraints, not enough scope to provide a large difference in lap times. And it is for that reason I'm already beginning to lose some interest in 2009. The constraints imposed by the rules have certainly had an influence in making the cars so equal in performance, Mr Soap. But there may be hope yet on the horizon - Max Mosley has begun to mutter about just imposing budget caps and freeing up the rules again! I don't think we've seen a level playing field yet so it's all a bit confusing but I think we'll get the picture at Barcelona...if not then, at about 6.30 PM Sunday 29th. here in Australia! Agreed about the level playing field, Leslie. Barcelona looks to be the big pre-season showdown with all the teams showing off their wares - let's hope that the rain does not always stay in Spain. They might very well be sticking close to one another to try and figure out how the draft is going to work. Force India is now McLaren-Mercedes so they should move up. Hondefunct will most likely be at the rear due to a serious lack of development and track time. I can't ever remember being as confused as I am now before any season. Usually we would have an idea who is quick. who is slow and who has particular problems. This year I have no idea although I think the idea of a competitive Toyota is very unlikely. I expect McLaren and Ferrari will set the pace with McLaren having a slight advantage owing to their tyre modeling tools. Those expecting a fast and fragile Red Bull should remember that RBR signed Geoff Willis to build reliability into Newey's designs as he did at Williams. It will probably be McLaren and Ferrari as usual, but it would be great fun, if things was turned around a bit. Let's say Toyota and Vettel at RB could fight for the wins. Or if Brawn/Honda surprises us all with a winner car. It would be nice to see Button on the podium. Brawn did use all 2008 for this year's car. In reality I guess they will be in the back, because Brawn uses all his time at the moment on the management buyout and they are missing all the tests. I'm loving that no-one is mentioning Webber and potential race wins this year in the RB5. Wherever I see Red Bull mentioned, people are automatically assuming that it's Vettel that will be dominating. Folk seem to be very quick to jump on the bandwagon for the Next Big (Young) Thing! Vettel is obviously quick, he can win races, but he's still only 21 and he's got a fairly large slab of expectation on his shoulders this year. But Webber's been consistently quick for a long time - he wrestled a Jaguar onto the front row of the grid!. If Mark can match Seb (let alone beat him), then I think a few people are going to be surprised, and opinions are going to be re-evaluated. In the interests of full disclosure, I'll own up to being a Webber fan, having followed him since his Australian Formula Ford days (his home town is next door to mine, how could I not be?). He's got the worst luck in modern Formula 1, but I think this season will be his best yet. I'm sticking my neck out and predicting a Mark Webber race win in '09. Having said all that, Vettel's been quicker in testing so far, but who knows what to read into that? Happy to eat humble pie on this one when they're on the front row in Melbourne, though! We already know that some teams will be using KERS in the first race and others like Ferrari are unlikely to be using it until at least a few races in to the season. Could it be that some of the cars have the KERS equipment in to test balance etc and others do not as they are preparing their cars to race without it? That is a lot of weight and could be the difference between the lap times. Maclaren for instance are one of the most likely to be using KERS in Melbourne to I can only assume they must be testing with it now. Timbo: I agree that Mark Webber could turn out to be the dark horse this year. I remain cautious about Vettel's trumpeted talents and would not be surprised to see Webbo equal or even exceed the German wunderkind's pace this year. As regards testing, we should remember, too, that Mark is still recovering from his broken leg and that may be hindering him. The Red Bull is quick as far as we can tell from the disrupted test sessions - and so there is no reason why a win should not be on the cards this season. I would guess that McLaren are having unexpected problems with the MP4-24 - there seems no reason to be reverting to the 2008 rear wing otherwise. But this is McLaren, after all, and they are quite likely to get the car sorted before Melbourne. That's one thing they are very good at - accelerated development. Lee: Yeah, it's a pity the teams don't tell us when they're using KERS and when they're not. I suspect that in McLaren's case, however, that they are genuinely having trouble getting the new car to behave as expected. It has been known to happen before - every team produces the occasional dog. Indeed, Maclaren could well be having problems. However I have heard mention that they are running a 2008 wing in order to cover up their speed and possibly a radical new 2009 wing. As soon as Kovi ran with the unveiled 2009 wing he was significantly quicker than with a 2008 wing. I wonder if come the next test we will see a very new wing design. Also it has been mentioned that although Hamilton was slow in the latest test, he had gone out very late (due to new parts being fitted) and the weather got very windy, yet he still posted a reasonable time with the slower 2008 wing design. At the end of the day testing is testing and we have no idea what parts are on the cars or what the drivers have been told to do in the cars. Renault could easily be testing Alonsos car for a qualifying setup and Prosts for a race setup. I expect we will only find out which are competitive when they get to Melbourne. Until then I expect Ferrari and Maclaren and possibly BMW to be qucker than the rest. All true, Lee - and so we remain in the dark until Melbourne as usual. Testing is like a Chinese takeaway - loads of interest at first but it all melts away when the season starts! Heidfeld came third in my driver ratings for 2008, Timbo - most people think I give him too much credit. But he impresses me more and more each season and I don't think we should take it for granted that Kubica will outperform him in 2009. It occurred to me that McLaren may have a Williams/Toyota diffuser in the works and the 2008 rear wing is to simulate the downforce of that diffuser and a 2009 wing.